In addition to all the LPC4357-DB1 demoboard components LPC4357-DB1-A evaluation board contains assembled connectors and plastic legs. You can use the side connectors to connect wide range of compatible extension boards (see below). The LPC4357-DB1-A modification of development board suites for software engineers, who need to evaluate the extended functionality of LPC4357-FET256 dual-core (Cortex-M4 + Cortex-M0) micro-controller, but don't want to bother with soldering. The LPC4357-DB1 evaluation board consists of the most essential components that you need to start your development. It contains the LPC4357-FET256 dual-core controller, USB, Ethernet and JTAG connectors, 4 push buttons + 4 LEDs, 16MBit external NOR flash. LPC4357-DB1-B and LPC4357-DB1-C evaluation boards also carry the external 64 Mbit SDRAM. The LPC4357-FET256 microcontoller is a first dual-core processor with Cortex-M4 DSP and Cortex-M0 co-processor. It contains 136 kB of internal SRAM and can operate at CPU frequencies of up to 204 MHz. 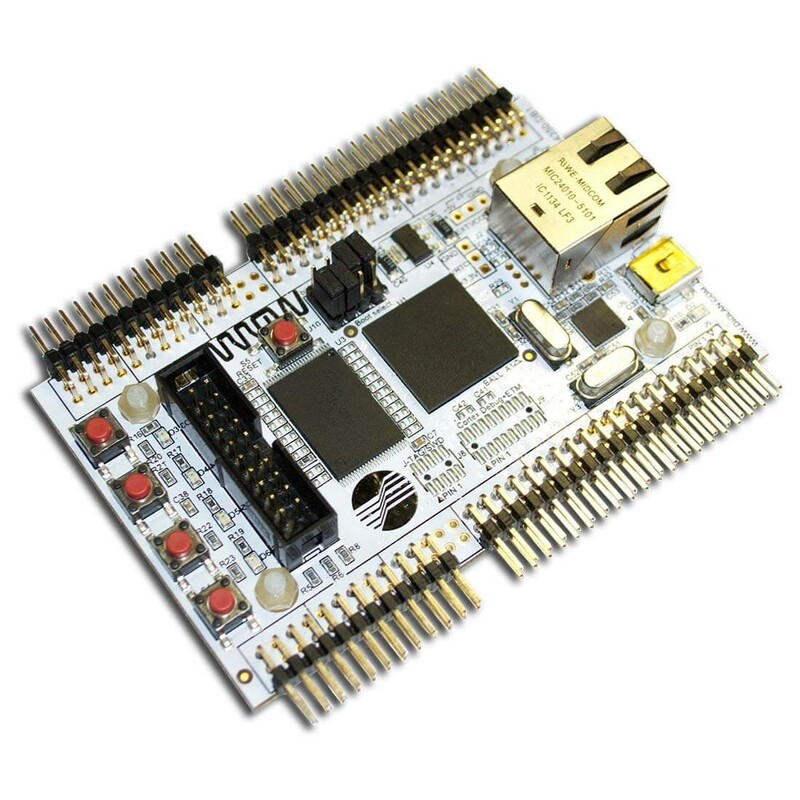 The LPC4357-DB1 evaluation board can be connected to a wide range of extension boards. These boards extends the LPC4357-DB1 peripheral with Touch Screen LCD, RS-232, RS-485 and CAN bus, HDMI interface. The LPC4357-DB1 development board contains most of the extensively used components. Its peripheral support can be easily extended by the LPC4357-DB1 PCB soldering options and wide range of extension boards. LPC4357FET256 - dual-core ARM Cortex-M4 DSP controller with Cortex-M0 coprocessor. USB 2.0 High-speed interface - with mini USB type-B connector. 10/100MBit Ethernet interface - LPC4357-DB1 evaluation board contains assembled external PHY and connector. External SDRAM - we have tested the board with Micron MT48LC4M32B2-7 Synchronous DRAM. Real-Time Clock (RTC) - there are placeholder for RTC crystal and connection points for external power supply. Cortex Debug Connector - the small and low cost 10-pin 1.27mm (0.05 inch) connector can be assembled to access SWD, SWV, and JTAG signals available on Cortex-M4 and Cortex-M0 processors. Cortex Debug + ETM Connector - this small 20-pin 1.27mm (0.05 inch) connector can be assembled to access SWD, SWV, JTAG, and ETM (4-bit) signals available on Cortex-M4 and Cortex-M0 processors. Email products support Email us to ask product support questions. Email orders support Email us to ask questions regarding purchasing and applied orders. Connectors and Jumpers Port and pins assignment on available connectors and jumpers description. Mechanical Drawing Board mechanical drawing. Software examples The LPC4350-DB1, LPC4357-DB1 and LPC1850-DB1 development boards are supplemented with a large number of software examples. Almost all of the examples can be compiled using either IAR Embedded Workbench or Keil MDK-ARM.